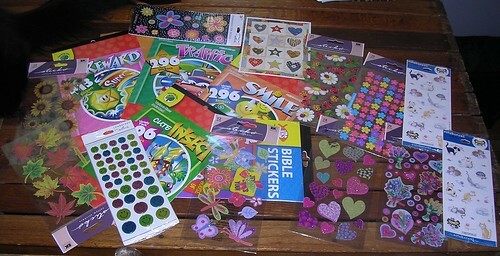 Lots and lots of stickers. Charly went to Hallmark and must have taken stickers from almost every spinner on their sticker tree. Patt went to the Dollar Store, I bet, and picked up the 296 packets. I was so excited. They read the blog. They know I mused about being close to out. Yes folks. It's the little things that make me deliriously happy. Now I have to write letters and send cards.